When this secretaire arrived in the workshop it appeared to be a typical walnut piece, that required some cleaning. Closer inspection revealed that the colour was a superimposed umber wash , designed to hide some previous misrepairs. This colour was carefully removed exposing the golden honey colour of the maple and the contrasting darkness of the rosewood. This cleaning transformed the secretaire into a spectacular piece of furniture. The wood is thick 3-4mm hand cut burrs of field maple with roswood banding to the drawer fronts, cabinet sides and half round mouldings to the cabinet bottom . Much previous repair had been carried out in walnut and then crudely coloured over. All the previous walnut was removed and the correct woods used . Numerous missing sections were replaced and raised and blistered sections relaid. I was able to use steamed rosewood where necessary which matched perfectly when treated with 75% nitric acid. Rosewood reapirs can prevent difficulties for the restorer due to the difficulties of lightening rosewood. It respopnds poorly to wood bleaches and faded rosewood repairs are not easy to match. Steamed rosewood , which are butts that have been prepared to be cut into veneers, and are lighter in colour helps overcome this problem. New maple was cut from burrs. 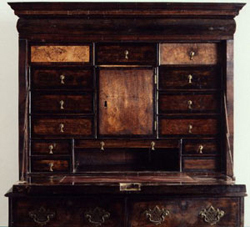 The three large top drawers were not original and it is probable that there were no drawers where you now see the three top drawers of the interior. These were reveneered in maple. The small bottom right drawer was missing a new one made up in the correct style. The interior brassware appeared original and the exterior brass was replaced to match. 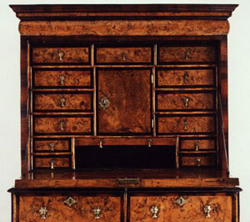 This secretaire functioned as a writing table but is also an early form of safe. The hinged door in the interior is over one inch thick and this compartment does not run all the way to back of the cabinet. Therefore the contents of this compartment are impregnible except from axe attack. There is also a very clever secret comparement, the location of which must remain a secret.